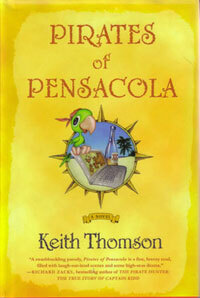 Bestselling author Keith Thomson is looking for a few good pirates, artists preferred. The author of the New York Times bestseller Once A Spy, is asking readers to submit their original photographs, paintings and drawings for a chance to be featured as the cover image for the digital edition of his modern-day pirate adventure Pirates of Pensacola. How to enter: If you haven’t already read the book, you can sample the first fifty pages for free at http://www.scribd.com/doc/133700015/Pirates-of-Pensacola-by-Keith-Thomson-Excerpt and http://www.KeithThomsonBooks.com. Next, send your original artwork in high resolution jpeg to PiratesofPensacola@gmail.com by May 24. Full cover designs using original artwork will be accepted. Keith and crew will review the entries and choose three images that best capture the spirit of the book. These three finalists’ work will be showcased at http://www.KeithThomsonBooks.com and on the Official Keith Thomson Author Facebook Page (https://www.facebook.com/KeithThomsonAuthor) during the week of May 27th. With the help of his pirate fans Keith will then choose the grand-prize-winner whose artwork will be used as the cover image. The grand prize winner and first runner-up will each receive a genuine piece-of-eight coin and the second runner-up will receive a signed first edition of Keith’s next novel, 7 grams of lead. Keith hopes that his fellow pirate fans will enjoy contributing their swashbuckling images and that the contest will give readers a way to join the pirate adventure and possibly find some treasure along the way. Keith created the current cover image for Pirates of Pensacola. It was used for the digital edition that Thomson donated to the Worldreader organization, a U.S. and European nonprofit that makes digital books available to children and their families in the developing world. Keith subsequently published the e-book on Amazon and Kobobooks. 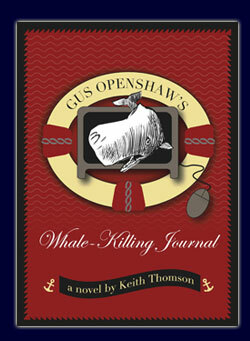 Contest details and a complete list of the official contest rules are available at http://www.keiththomsonbooks.com. This book would be easy to underestimate; its premise of a modern-day classical pirate kidnapping his estranged accountant son in a quest for buried gold sounds like fine material for an over-the-top parody, and its cover featuring a cartoon parrot perched on a lap top computer certainly implies a happy-go-lucky seagoing adventure – yet neither feature betrays a hint of how much is really at work here.